The saboteurs who shot up a Pacific Gas & Electric Co. substation in April were “very experienced marksmen,” a former PG&E executive told PJM’s Grid 20/20 conference Tuesday. At least two gunmen were believed involved in the attack on PG&E’s Metcalf 500/230 kV substation near San Jose about 2 a.m. April 16. Mark Johnson, formerly vice president of transmission operations for PG&E, said the gunmen targeted transformer radiators, firing an estimated 150 rounds. The gunmen hit 10 of 11 banks, causing a “slow bleed” resulting in the loss of 52,000 gallons of cooling oil. The shooting occurred minutes after the suspects are believed to have cut underground fiber optic cables a half mile from the substation, briefly knocking out phone and 911 service in the area. 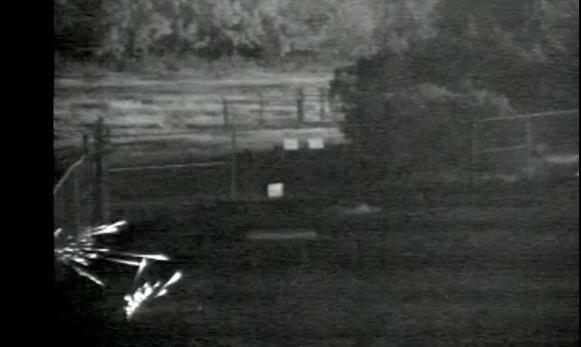 Surveillance video shows bullets hitting a chain link fence outside Pacific Gas & Electric Co.’s Metcalf substation during an attack April 16. “These were not amateurs taking potshots,” Johnson said. “…My personal view is that this was a dress rehearsal” for future attacks. It took nearly a month to replace the radiators and return the substation to normal operations. The incident also indicated a need to reconsider the deployment of security cameras, which are typically aimed down the fence line to spot trespassers. “If we had cameras looking out we might have seen the perpetrators,” he said. Officials believe more than one person was involved because of the number of shots fired and because of the logistics of getting into the manhole to cut the fiber optic lines, Johnson said. He declined to say afterward whether the suspects are believed to be present or former utility employees, acknowledging “wide speculation” on that question. The incident underscored a risk raised last year by Federal Energy Regulatory Commission Chairman Jon Wellinghoff. Wellinghoff told Bloomberg News that he feared saboteurs with guns could target transformers. Transformers are often custom built and can take 18 to 36 months to replace, Wellinghoff said. FERC and NERC cautioned against overreacting to last year's substation sabotage, with two FERC commissioners taking a swipe at a former colleague who has been sounding the alarm. A summary of the issues scheduled to be brought to a vote at the Markets and Reliability and Members committees meetings Feb. 23, 2017. FERC will hold a technical conference April 1 to discuss issues raised by this winter’s extreme cold, which exposed vulnerabilities in the grid’s increasing reliance on natural-gas fired generation.